The Yorkie Bar of film returns - are you ready for another dose of 80's-tastic action? This is the bit where I usually describe the story, plot and premise of the film, but let's face it The Expendables 2 isn't about that at all - it's just about the names, so here goes: Sylvester Stallone, Jason Statham, Jet Li, Jean-Claude Van Damme, Dolph Lundgren, Terry Crews, Randy Couture, Chuck Norris, Bruce Willis, Arnold Schwarzenegger. Did I miss anyone out? 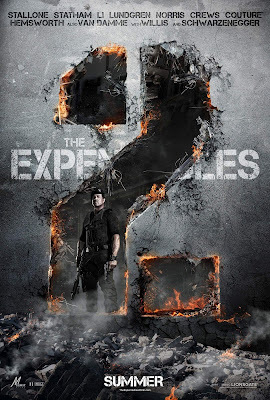 The Expendables 2 is released in cinemas across the UK on August 17th 2012. Do you have to be Man or Mad to see this sequel? Do you think it will be a blockbuster or lacklustre? Leave your comments below!